The 2015 Chevrolet Silverado 3500HD and the Dodge Ram 3500 are among the most powerful heavy-duty pickup trucks on the road. Shoppers can choose from a variety of powertrains and body configurations to tailor their models to suit their individual needs. If you're having trouble deciding between the two, check out our side-by-side comparison. Both models offer a variety of high-powered engines, but the 2015 Chevrolet Silverado 3500HD delivers a smooth, refined ride. Its base 6.0-liter V8 engine produces 360 horsepower and 380 pound-feet of torque. It's paired with the standard six-speed automatic transmission. 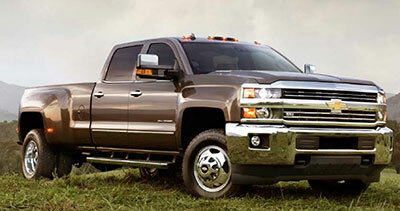 An optional 6.6-liter turbodiesel V8 engine boosts the Silverado's output to 397 horses and 765 pound-feet of torque. This engine is mated to an even more impressive six-speed automatic transmission. Silverado 3500HD shoppers can choose between rear- and four-wheel drive. Properly equipped (and depending on body style), the 3500HD can tow up to 23,300 pounds. Its maximum payload is 7,374 pounds. The Ram 3500 comes standard with a 5.7-liter V8 engine. It makes 383 horses and 400 pound-feet of torque. Shoppers can also choose between two optional engines. The 6.4-liter V8 generates up to 410 horses and 429 pound-feet of torque. The 6.7-liter turbocharged diesel inline-6 generates up to 385 horses and 865 pound-feet of torque, depending on transmission. Depending on body style, equipment, and engine, the Ram 3500 can tow up to 30,000 pounds. Its maximum payload is 6,580 pounds. Both trucks offer similar options, but we like the 2015 Chevrolet Silverado 3500HD's roomy cabins and available features. Shoppers can choose between three cabins: the regular, double, and crew. Drivers can also select either single-rear-wheel (SRW) or dual-rear-wheel (DRW) configurations. All but the crew cab models are paired with an 8-foot long bed. SRW crew cab shoppers can choose between the long and standard, 6.5-foot bed. Finally, shoppers can decide between the Work Truck, midgrade LT, or upscale LTZ trim models. The Ram 3500 also offers three cabin styles: regular, crew, and jumbo crew. The latter is known as the Mega Cab. It offers the most passenger space and comes standard with the short, 6-foot-4-inch bed. The regular cabin is paired with the long, 8-foot bed. Crew cab shoppers can choose between the short and long beds. As with the Silverado 3500HD, the Ram 3500 can be had with either SRW or DRW. Thanks to its high-tech options, the 2015 Chevrolet Silverado 3500HD is our pick for safety. Upper trim models are equipped with OnStar telematics, which is designed to help drivers out of problematic situations with features like remote door unlocking and on-demand roadside assistance. Shoppers can also add a variety of systems to increase driver vigilance, including forward-collision alert and lane-departure warning. Like the Silverado 3500HD, the Ram 3500 comes with a long list of safety features designed to help maximize on-road control. These include antilock brakes and traction and stability control. Drivers can add a rearview camera to either truck, making it easier to reverse safely. The 2015 Chevrolet Silverado 3500HD delivers a smooth, refined ride. In spite of its massive powertrains, the cabin remains impressively quiet. Drivers will like how the Silverado 3500HD handles in just about any setting, from urban cityscapes to narrow mountain roads. In terms of ride quality, the Ram 3500 isn't far behind. It tackles turns with confidence. Although it was designed to haul and tow massive loads, it delivers a composed, comfortable ride. The 2015 Chevrolet Silverado 3500HD is our overall pick in this heavy-duty segment. Shoppers can choose from a wide range of configurations to create the pickup truck that best suits their commercial needs. The Silverado 3500HD delivers roomy cabins and shoppers can add a variety of high-tech features. Its safety features help protect passengers on the road. Engine options deliver the power drivers need to haul and tow substantial loads.